Assessment of health-related quality of life (HRQL) is important in patients with chronic obstructive pulmonary disease (COPD). Despite the high prevalence of COPD in Germany, Switzerland and Austria there is no validated disease-specific instrument available. The objective of this study was to translate the Chronic Respiratory Questionnaire (CRQ), one of the most widely used respiratory HRQL questionnaires, into German, develop an interviewer- and self-administered version including both standardised and individualised dyspnoea questions, and validate these versions in two randomised studies. We recruited three groups of patients with COPD in Switzerland, Germany and Austria. The 44 patients of the first group completed the CRQ during pilot testing to adapt the CRQ to German-speaking patients. We then recruited 80 patients participating in pulmonary rehabilitation programs to assess internal consistency reliability and cross-sectional validity of the CRQ. The third group consisted of 38 patients with stable COPD without an intervention to assess test-retest reliability. To compare the interviewer- and self-administered versions, we randomised patients in groups 2 and 3 to the interviewer- or self-administered CRQ. Patients completed both the standardised and individualised dyspnoea questions. For both administration formats and all domains, we found good internal consistency reliability (Crohnbach's alpha between 0.73 and 0.89). Cross-sectional validity tended to be better for the standardised compared to the individualised dyspnoea questions and cross-sectional validity was slightly better for the self-administered format. Test-retest reliability was good for both the interviewer-administered CRQ (intraclass correlation coefficients for different domains between 0.81 and 0.95) and the self-administered format (intraclass correlation coefficients between 0.78 and 0.86). Lower within-person variability was responsible for the higher test-retest reliability of the interviewer-administered format while between person variability was similar for both formats. Investigators in German-speaking countries can choose between valid and reliable self-and interviewer-administered CRQ formats. Clinicians and investigators are showing increasing agreement that measurement of health-related quality of life (HRQL) is important for patient management. For patients with chronic diseases such as COPD, the aim of treatments is to reduce symptoms and to improve quality of life. However, only translated[3, 4] but no clinically validated German versions of COPD-specific quality of life instrument exist. The interviewer-administered "Chronic Respiratory Questionnaire" (CRQ) is a valid, reliable and responsive instrument. [7, 8] that has seen extensive use. [9–11] The CRQ is simple to use and there is a significant body of literature guiding their interpretation. [12–15] However, the requirement for an interviewer may be inefficient and some investigators suggested that the individualised dyspnoea questions increases the time needed for administration. [8, 16] A self-administered version of the CRQ as well as a standardised dyspnoea domain are both available. These administration formats need evaluation before investigators can confidently use them in clinical trials. In addition, there is a need for a validated COPD-specific instrument in German-speaking countries. Ideally there should be one culturally adapted version for all German-speaking countries to ensure comparability of CRQ scores across these countries in future clinical trials. Therefore, the aim of this study was to translate the English versions of the interviewer- and self-administered CRQ as well as the individualised and standardised dyspnoea domains into German and to validate these formats concurrently in Switzerland, Germany and Austria. We focus in this report on the instrument development, cross-sectional validity and reliability. We report the evaluative properties of the German CRQ including responsiveness and longitudinal validity elsewhere. We recruited three separate groups of patients with COPD (see table 1) with a FEV1/FVC < 70% predicted and postbronchodilator FEV1 < 80% predicted according to GOLD criteria COPD and no restriction of disease severity. Inclusion criteria were further: German as the first or "daily" language, age > 40 years, and ability to complete the CRQ within one session. We excluded patients with inability to read or write, with cognitive difficulties, with cancer or lung diseases other than COPD. The first group of patients consisted of 44 patients from four rehabilitation clinics and a University hospital in Switzerland (Zuercher Hoehenklinik Wald, Klinik Barmelweid and University Hospital of Zurich), Germany (Pulmoresearch Institute Hamburg) and Austria (Rehabilitationsklinik Weyer/Enns). In these patients we pilot tested the CRQ formats during the translation and adaptation process (table 1). These patients did not participate in the subsequent validation study. We recruited an additional 80 patients (group 2) from the same four rehabilitation centres. These patients followed an intense multidisciplinary pulmonary rehabilitation program that consisted mainly of physical exercise but also offered patient education, relaxation therapies and psychosocial support. In these patients we assessed the internal consistency reliability and the cross-sectional validity of the German CRQ. Finally, we recruited a third group of patients (group 3, n = 38) who did not undergo any changes in the therapeutic management for at least six weeks and were in a stable pulmonary condition to assess test-retest reliability of the German CRQ. We recruited these patients from one University hospital (Zurich, Switzerland) and private offices of pulmonologists in Switzerland and Germany. The CRQ is divided into the four domains of fatigue, emotional function, mastery and dyspnoea. Patients answer to each of the 20 questions on a seven points scale expressing the degree of disability from 1 (maximum impairment) to 7 (no impairment). The standardised dyspnoea domain comprises five items concerning activities that cause shortness of breath in some patients with COPD as previously described. [18, 19] When applicable we trained all interviewers in the use of this instrument in identical fashion to ensure consistent application following the recommendations of the developer of the original CRQ (GHG). We followed a sequential forward and backward translation approach (applied in patient group 1) (see figure 1). Two translators independently translated the English interviewer administered CRQ (CRQ-IA) and self-administered CRQ (CRQ-SA) as well as the individual and standardised dyspnoea items into German. In a Consensus Meeting with the translators, two pulmonologists and a methodologist agreed on first German versions for these formats. We then pilot tested these versions in 10 patients of group 1 to identify difficulties in understanding. In addition, we tested various possible wordings of items, answer choices and instructions if the translation team considered more than one possible version. An English translator with experience in biomedical sciences but unaware of the original English CRQ performed a back translation of the German CRQ formats into the source language (English). A team of McMaster University investigators compared the back translation with the English CRQ to check for conceptual discrepancies. After administration of the CRQ to an additional 23 patients in group 1, the translation team discussed the comments from these patients and decided in consensus on modifications. Finally, we recruited another 11 patients (belonging to group 1) to investigate whether these changes were appropriate. To allow comparisons between the different administration formats of the German CRQ, we validated them concurrently in two randomised studies. In the first study we randomly assigned 80 patients to either the CRQ-IA group (n = 40) or CRQ-SA group (n = 40). All patients completed the individualised and standardised dyspnoea items. To eliminate order effects we also randomised the order of administration (first individualised, then standardised or vice versa). We assessed all patients within 3 days after enrolment in any of the four rehabilitation programs. In the second randomised study, we used the same randomisation procedure and included 38 stable patients (group 3). These patients completed the CRQ twice, ten days apart. These patients were blinded to their previous scores at the follow-up interview and did not undergo any therapy changes. We generated two separate randomisation lists by computer (one for group 2 and one for group 3) in blocks of four per centre. Allocation of patients to either the CRQ-IA or CRQ-SA was concealed using a central telephone system. The site investigators, who were unaware of details on block randomisation, contacted the study coordinator (MP) by telephone for each patient who had given informed consent to receive the group assignment. The study coordinator registered the patient's initials, gender and date of birth to verify if all patients were allocated correctly. All local ethics committees approved the study protocol and patients provided informed consent prior to participation in the study. Patients performed a six-minute walking test to assess functional exercise capacity at the beginning and end of the rehabilitation. In addition, we used a modified Borg scale in German to assess the intensity of perceived dyspnoea at the end of the six-minute walking test. The Borg scale consisted of a scale labelled from 0 to 10 and with verbal descriptors. Zero represented "no dyspnoea at all" and 10 "very, very severe dyspnoea". We used two additional instruments to assess HRQL: The German self-administered SF-36 Health Survey and the Feeling Thermometer (FT). The SF-36 is a generic instrument for assessment of HRQL and assesses 8 subscales of HRQL. Other investigators used the SF-36 in trials with COPD patients participating in respiratory rehabilitation. The FT is an anchor based visual analogue scale from 0 to 100 where 0 (dead) represents the worst and 100 (full health) the best health state. Accumulating evidence suggests that the FT works well as a HRQL instrument in various groups of patients, including patients with COPD [24–26]. All these outcome measures were taken at the same time as the CRQ administration, i.e. at the beginning and end of the rehabilitation. We calculated CRQ domain scores by summing the scores of the single items and then dividing the sum by the number of items in the respective domain. We used parametric tests because scores on the seven points Likert-type scale did not differ significantly from a normal distribution (Shapiro-Wilk test and analysis of normal quantile-quantile plots). We assessed internal consistency for each domain by calculating Crohnbach's alpha for CRQ baseline scores. In addition, we calculated for each standardised item its corrected item-total correlation, which should exceed 0.2 and calculated Crohnbach's alpha again excluding the item under study. We did not include the individualised dyspnoea domain in this analysis because patients select different items so that the domain cannot be assessed across patients for internal consistency. To assess cross-sectional validity (in patient group 2) we used Pearson correlation coefficients between the CRQ baseline scores and those of the validation measures. Finally, we assessed test-retest reliability using intraclass correlation coefficients for the baseline and follow-up CRQ domain scores of the stable COPD patients (group 3) by taking the between person variance at baseline and follow-up as the signal and within person variance as well as between person variance at baseline and follow-up as the noise. All statistical analyses were performed with SPSS for Windows version 10.0 (SPSS Inc, Chicago, Ill). The wording of the questions and answer choices correspond to the original version. We did not add or remove items nor change the answer scales apart from adaptation to German. Modifications became necessary for the instructions of the individualised dyspnoea items of the CRQ-SA. The original translation of the instructions was too extensive and too complicated and patients were unable to complete this domain by themselves without difficulties. Therefore, we simplified the instructions omitting some of the instructions that added text without contributing substantially to the understanding. In addition, we listed each item of the individualised and standardised dyspnoea domain separately. This means that there are five separate questions for the dyspnoea domain. Patients at times were surprised that the list of activities of the individualised dyspnoea domain did not begin with a physical activity ("being angry or upset"). Therefore we placed this item at position 5 of the list of 26 items. Accordingly, the standardised dyspnoea question 1 of the English CRQ ("Shortness of breath when being angry or upset") was unchanged but placed as question 3 in the German CRQ. We pilot tested the changes and patients were able to complete the German CRQ-SA without major difficulties and understood all items and answer choices. Nine patients did not complete the study for the following reasons: five withdrew for non-specified reasons (one patient in CRQ-IA group and four in CRQ-SA group) and two patients did not meet the a priori inclusion criteria upon review of their baseline data (one patient in each group with FEV1/FVC > 70%). In addition, two patients of the CRQ-SA group discontinued the rehabilitation program shortly after admission (one patient had an acute exacerbation requiring inpatient care and the other went home shortly after beginning of the rehabilitation). We excluded these two patients because we had decided a priori to include only patients with complete validation data in the analysis. The baseline characteristics of these two patients did not differ from the included patients. Thus, we analysed data from 38 patients of the CRQ-IA group and 33 patients of the CRQ-SA group. The patients of the two groups (CRQ-IA and CRQ-SA) were similar at baseline: Mean age was 67.4 years (SD 8.7) in the CRQ-IA and 67.7 (SD 8.3) in CRQ-SA group, FEV1/FVC predicted was 48.5% (SD 13.3) in the CRQ-IA and 49.9% (SD 10.5) in the CRQ-SA group and the average smoking history was 44.9 pack years (26.1) in the CRQ-IA and 46.8 (27.6) in the CRQ-SA group. Crohnbach's alpha for baseline data were between 0.73 and 0.89 for both administration formats and met our a priori defined requirements for adequate internal consistency reliability (table 2). For the CRQ-IA, corrected item-total correlations for baseline data were for all but one item above 0.32 (table 3). Item 9 ("How often during the last two weeks have you felt embarrassed by your coughing or heavy breathing?") had a very low item-total correlation of -0.03. If this item was deleted internal consistency reliability would be markedly improved (0.86). Corrected item-total correlations tended to be higher for the CRQ-SA (0.37–0.85). As for the CRQ-IA item 9 showed the lowest corrected item-total correlation but was considerable higher compared with the CRQ-IA (0.37). Correlations with other validation measures were generally higher for the standardised dyspnoea questions compared to the individualised questions and for the self-administered compared to the interviewer-administered dyspnoea questions, respectively (table 4). The correlations of the CRQ-SA dyspnoea domain with the FT, the SF-36 Mental Health and Vitality Index were higher than those of the CRQ-IA. Cross-sectional validity for the individualised and standardised dyspnoea domains: Correlations for baseline scores. CRQ-IA = Interviewer administered German Chronic Respiratory Questionnaire. 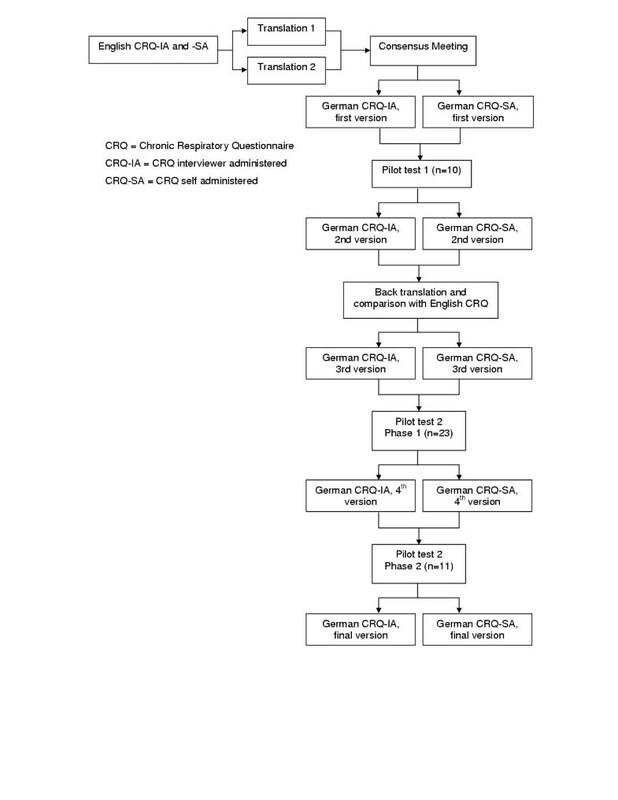 CRQ-SA = Self-administered German Chronic Respiratory Questionnaire. † Pearson Correlation Coefficient (95% confidence intervals); r > 0.28 significant at p < 0.05. * indicate significant differences between the individualised and standardised dyspnoea domains §indicate significant differences between the domains of the CRQ-IA and CRQ-SA. For the fatigue domain, the correlations were similar for the CRQ-IA and CRQ-SA except for the correlations with the six-minute walking test, which was significant higher for the CRQ-IA (table 5). We did not observe statistically significant differences between the CRQ-IA and CRQ-SA for the correlations of the emotional function and mastery domain. In patients randomised to the CRQ-IA (n = 16), mean age was 63.7 (SD 9.1), FEV1/FVC in percent-predicted 44.3 (SD 10.4) and patients had a mean smoking history of 52.4 pack years (SD 28.9). Mean age in the CRQ-SA group (n = 19) was 61.1 (SD 8.0), FEV1/FVC in percent-predicted 44.4 (SD 13.6) and a mean smoking history of 54.6 pack years (SD 33.8). Intraclass correlation coefficients were higher for the CRQ-IA but also well above 0.7 for all CRQ-SA domains (table 6). Lower within-person variability was responsible for the higher test-retest reliability of the interviewer-administered format while between-person variability was similar for both formats. We developed different administration formats of the German CRQ and validated them in two randomised studies. We found good internal consistency reliability for the interviewer- and self-administered CRQ. Cross-sectional validity was higher for the standardised compared to individual dyspnoea questions. Test-retest reliability exceeded our preset threshold (intraclass correlation coefficient > 0.7) for both the CRQ-IA and the CRQ-SA. The strengths of our study included the stepwise development of the German CRQ formats, which allowed us to reconsider and to test the different versions in three stages of pilot testing. The aim of this approach was to add quality with every step in terms of conceptual equivalence between the source and target version as well as in terms of comprehensibility for the patients. While the CRQ-IA was easy comprehensible for patients, we noticed through pilot testing that patients had difficulties completing the individualised dyspnoea items of the initial German translation of the CRQ-SA independently. However by modifying and pilot testing the instructions of this individualised dyspnoea domain we were able to develop an improved version. We found for item 9 ("How often during the last two weeks have you felt embarrassed by your coughing or heavy breathing?") a very low item-total correlation of -0.03. Because there is no apparent explanation for this finding, we used the data set of patient group 3 (test-retest) and analysed the item-total correlations of the emotional function domain. We found item-total correlations of 0.51 for the CRQ-IA and 0.50 for the CRQ-SA for item 9. For all items of the emotional function domain the item-total correlation was between 0.44 and 0.85. Thus we assume that the low item-total correlation in patient group 2 was due to chance. The careful development of the German CRQ has led to reliable and valid self- and interviewer administered CRQ formats and individualised and standardised dyspnoea questions. The need of an interviewer and the time-consuming selection process of the individualised dyspnoea questions are no longer a hindrance for the use of the CRQ: Investigators can choose between self-and interviewer administered formats and individualised and standardised dyspnoea questions based on efficiency considerations. The brevity of the standardised CRQ-SA with good validity, reliability and responsiveness makes the CRQ-SA an attractive choice for trials as well as for clinical practice. GlaxoSmithKline Switzerland and the Swiss Lung League funded this study with grants to the Horten Centre (MP). The sponsors were not involved in the study design, conduction of the trial, analysis of data and manuscript writing. MP, MB, MF, OB, HS and GG designed and organised the study; MB, MF, TG, OB and AL collected the data and supervised the study at their study sites, MP and HS analysed the data and wrote the first draft of the manuscript, MB, MF, TG, OB, AL and GG critically reviewed the manuscript and MP and HS prepared the final version of the manuscript. The CRQ-IA and CRQ-SA are copyrighted by McMaster University; Principal Authors Dr. Gordon Guyatt and Dr. Holger Schünemann. Use of the instrument requires licensing. We would like to thank Cornelia Flamann (Zuercher Hoehenklinik Wald) and Dr. Marco Laschke (Klinik Barmelweid) for data collection in their centres.